3 Bedroom Town House For Sale in Sheffield for Offers Over £230,000. 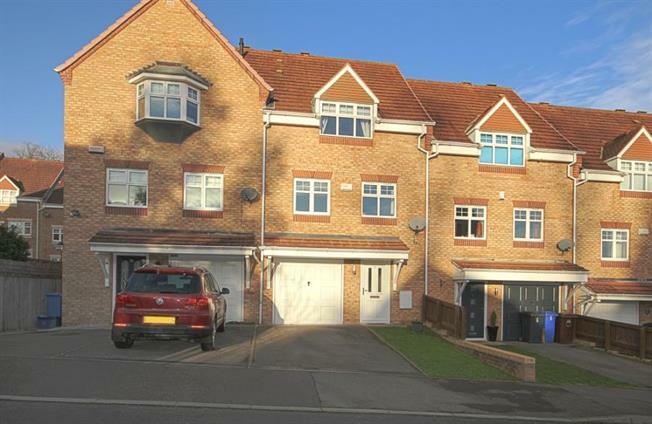 An internal inspection is imperative to appreciate this beautifully presented three double bedroomed town house located in the heart of the sought after and highly convenient Wadsley Park Village development. Offering spacious accommodation over three levels with the benefit of double glazing, GCH, beautiful conservatory, driveway, integral garage, rear garden and three bath/shower rooms. The Wadsley Park Village development is ideally located for excellent local amenities including local shops, supermarkets and retail park, schooling, public transport links with Supertram park and ride at Middlewood, access to surrounding countryside and local gold club, road network to motorways and hospitals and further amenities in Hillsborough including leisure centre and library. The accommodation comprises and entrance door opening to the hallway with downstairs WC, access door to the Garage and stairs to first floor. The Kitchen/Diner is fitted with an excellent range of base and wall units in a modern shaker style finished in cream with contrasting granite effect work surfacing with inset sink. Coming complete with integrated, oven hob and extractor, plumbing for dishwasher and tiled splash backs and flooring with window to the rear and doorway to the Conservatory. The Conservatory is of half brick construction with PVC units to three sides, Polycarbonate roof and French doors to the garden. On the first floor the Lounge has a pair of windows to the front allowing excellent natural light with wood effect flooring. The Master Bedroom is carpeted with a pair of windows to the rear overlooking the garden, having fitted wardrobes to one wall and door to ensuite with WC, wash basin and recessed shower unit. On the second floor, double Bedroom two has dormer style window to the front, carpeted with doorway to ensuite with WC, wash basin and corner shower unit. Double Bedroom Three has window to the rear and wood effect flooring. The family Bathroom has three piece suite comprising WC, wash basin and bath with tiled splash backs. To the exterior of the property is an open plan lawned garden to the front with driveway providing access to the garage, having power and light. To the rear is a delightful garden area with patio, lawn and borders providing an excellent outdoor seating and entertaining area.